The roads of Japan are littered with an infinite number of sights that are out of the ordinary but one of the most unusual highlights is a pop phenomenon known as Dekotora. 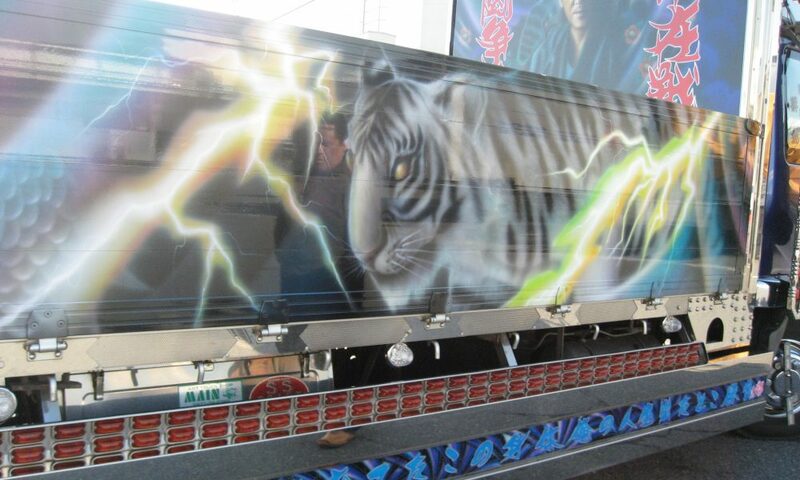 Dekotoras (decorated trucks) first appeared on Japan’s roads about 30 years ago. Boasting shiny fenders, vibrant dashboards and airbrushed flanks, the decotoras that plied the roads in the 1970s brought a dash of color to the nation’s drab highways. In fact the trucks attracted so much attention they caught the eye of an up-and-coming film producer, who decided to make a feature called Truck Yaro, which was released in 1975. Curious audiences flocked to the cinema to see the movie and, in the years that followed, decotoras gained a cult status that was previously unheard of. In August this year, director Katsuki Hideyuki completed filming the third movie in the dekotora series at Shimizu Port. Entitled Flower of Love Blossoming, the film centers on a character called Shuichiro, who is played by the immensely talented Aikawa Show. Producer Tamegoro Sudo, a jack of all trades, who gets up at 5am to bake bread before embarking on numerous errands, wanted to base the film’s main character on his own personality – self-assured and confident. Actor Aikawa Show was perfect for the lead role, ensuring Shuichiro came across as an intense character who preferred to listen to other’s concerns and let his actions do the talking. Shuichiro is the ultimate folk hero, and a fitting tribute to the earliest decotora star of the silver screen, Hoshi Momojiro in the movie Truck Yaro. The main character was actually based on Yasuo Miyazaki, an amazing man who possesses a thin moustache and a smile that is almost as vast as his manners. Miyazaki, however, plays down his own contribution to the decotora scene. 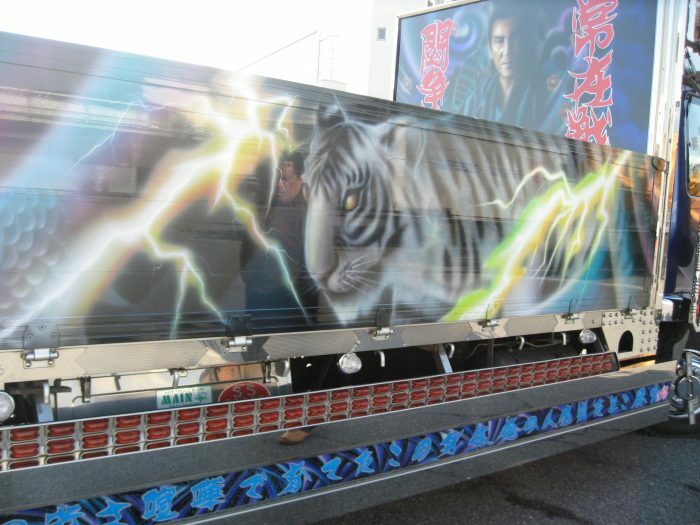 Dekotora drivers are renowned for their modesty, something producer Sudo was keen to portray in the third film. According to magazine editor Takakuwa, there are about 300,000 to 400,000 dekotoras in Japan. He dreams of one day taking some of these trucks abroad in order to spread the positive message of peace to all corners of the world. A version of these interviews appeared in J SELECT November 2005 Issue.